Even though the Desert Sled technically belongs to the Scrambler family, it doesn’t. It’s a genuine off-road capable bike in retro form, currently the only bike of its kind on the market. 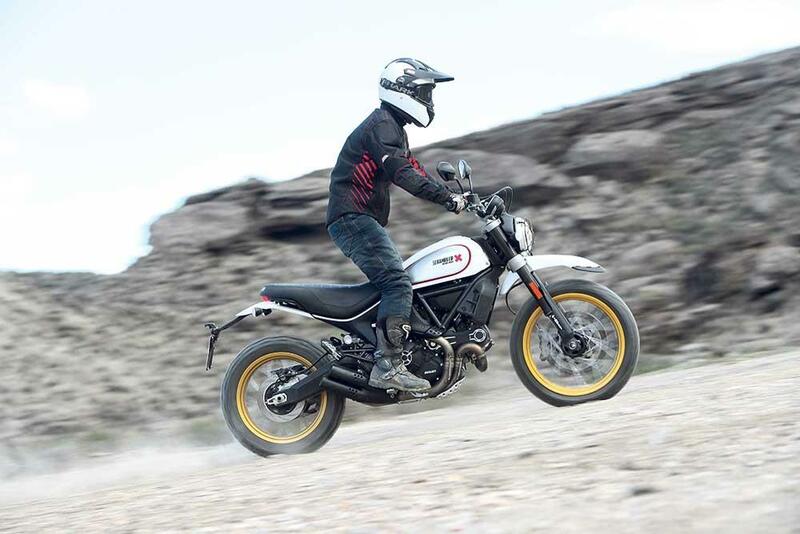 If you fancy the Scrambler style but don’t like the idea of going off-road, then this isn’t for you. Ducati has put serious effort into the Sled’s off-road credentials, and they’ve done a brilliant job of delivering a first true homage to the ‘Scrambler’ name. The most important revisions are the all new KYB suspension systems and reinforced frame. Ducati swapped out the 41mm non-adjustable front fork for chunkier 46mm fully-adjustable (preload, rebound and compression) stanchions. The rear trades the standard steel shock for KYB’s enduro aluminium unit with a heftier piston and is now preload and rebound adjustable too. Both are completely new bits of kit with longer travel (200mm front and rear) and specifically set-up for dirt riding. As a result, Ducati has reinforced the frame and extended the swingarm. The swingarm is now fixed to the frame directly instead of the engine so it can take harder impacts and has also been lengthened for stability and to compensate for the longer travel suspension. Flying over ruts, spitting sand and locking up the rear wheel (thanks to the switchable ABS) is easy peasy. Off-roading is so much easier than it should be on the Sled. In fact, it handles better and is more accomplished on the rough stuff than most middleweight adventure bikes. And that’s because it’s more of a big dirt bike than a retro styled pretender. It’s a half-way house and belongs in the mid-displacement adventure bike market more so than the current crop of Scrambler offerings. This one’s not just designed to look like an off-roader, like its predecessor- the Ducati Urban Enduro, but built specifically to go off-road. Customers have been calling out for a retro styled bike with real dirt going capabilities. 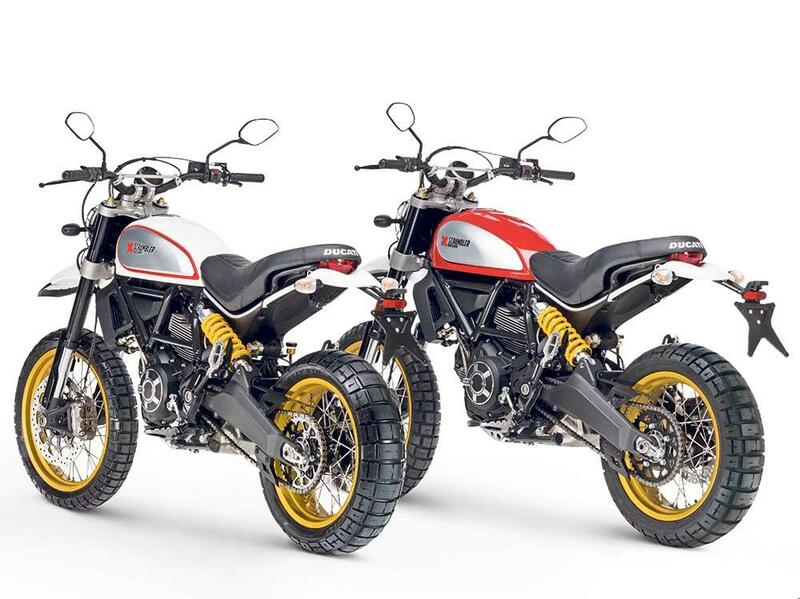 It’s not going to win any enduro races, but it does offer a decluttered, stylish alternative to the conventional dual-purpose machine and is the only proper dual-purpose scrambler on the market. And it’s seriously good fun, too. 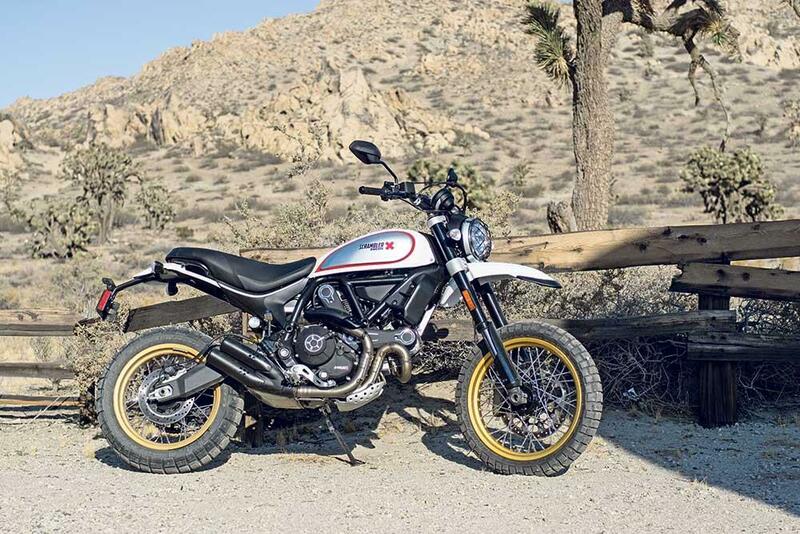 The Desert Sled still belongs to Ducati’s Scrambler family and uses the same 803cc air-cooled motor. To make it even easier to ride the throttle response has been softened too (thanks to Euro4 compliant revisions) and the pokey twin is excellent for easy going riding. It’s friendly low down with plenty of tractable power, won’t excite fast riders, but offers enough of a kick to keep even the itchiest of wrists happy. 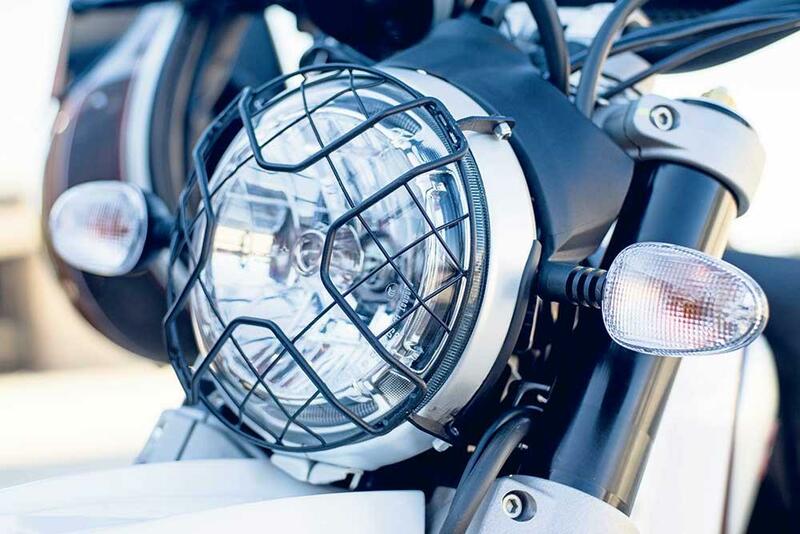 The Scrambler family has proved reliable since its inception and quality and finish is excellent. The Sled is priced at £9,395 for the red model and £9,495 for the white model. It gets a new headlamp grill, mudguards front and rear, new posh exhaust system, detachable rear pillion pegs and the bashplate from the Urban Enduro model. So far so good. The Sled gets the Multistrada Enduro’s posh grippy pegs with removable rubber inserts, they’re positioned lower and further forward. 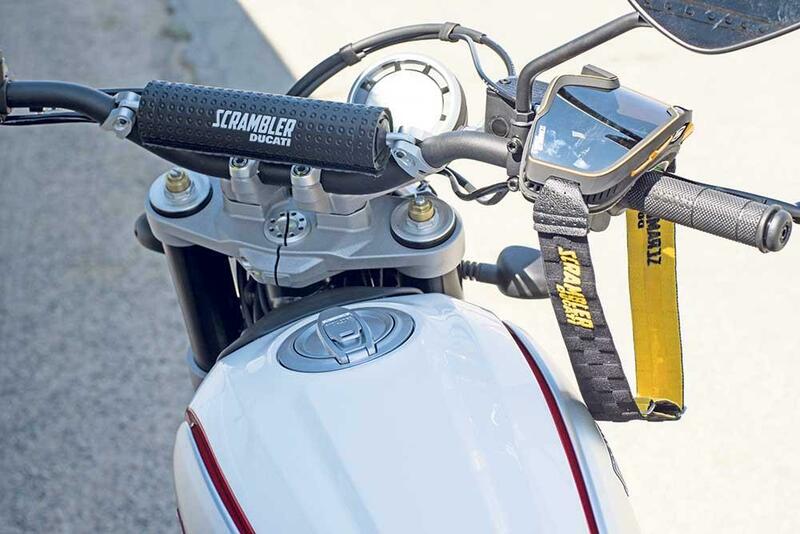 And it’s also pinched the Scrambler Full Throttle’s low motocross style handlebar, which has been rolled forward and treated to a brace. The Sled also gets a new larger 19” front wheel, and both the front and rear tyre widths have been slimmed down to help the rubber cut through the rough stuff. Rear suspension Single Kayaba rear shock. Preload and rebound adjustable. No owners have yet reviewed the DUCATI SCRAMBLER 800 Desert Sled (2017-on).